The very title of this chapter would have been contentious in the nineteenth century, when detailed scientific study of the nervous system got underway. For it was then not generally agreed that the nervous system is composed of many individual nerve cells. This was mainly due to the fact that nerve cells are difficult to visualise with routine histological methods. Many cells are packed tightly together in nervous tissue (there are 100000 nerve cells in 1mm3 of human brain) and they give off fine, branched processes, so that it is almost impossible to determine the limits of a single cell. Many scientists therefore believed that nerve cells were fused together in a continuous network of branched processes, rather like the capillary beds that link small arteries and veins. The technique that was most powerful in challenging this view was silver staining, first discovered by Camillo Golgi in 1873 and developed by others, particularly Santiago Ramon y Cajal from 1888 onwards. Ramon y Cajal examined many parts of the nervous system in a wide range of animal species. He realised that the special feature of silver staining is that it only stains a small percentage of cells in a piece of tissue but it stains them in their entirety, so that the structure of an individual nerve cell can be described (Fig. 2.1). Nowadays, single neurons are often stained by the intracellular injection of dye through a microelectrode, or by the use of methods that recognise chemicals characteristically found in particular neurons. In 1891, an anatomist named Wilhelm Waldeyer reviewed all the evidence from microscopical and developmental studies and concluded that the nervous system, like other organ systems, is indeed composed of discrete cells. He suggested the term neuron for the nerve cell. 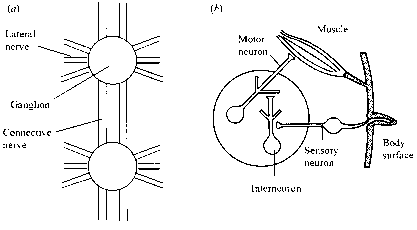 Figure 2.2 Diagrammatic comparison of nerve cell structure in (a) vertebrates and (b) arthropods, illustrated by motor neurons. was provided in the 1950s by studies with the electron microscope, which revealed that a gap separates the plasma membrane of adjacent nerve cells. These studies also showed that a nerve cell contains an assemblage of intra-cellular organelles, such as endoplasmic reticulum and mitochondria, just like any other animal cell. These organelles are required to carry out the usual metabolic functions of an animal cell. At the same time, nerve cells are specialised in their anatomy and physiology to carry out the particular function of processing information. Figure 2.3 General arrangement of the nervous system and three basic categories of neuron, illustrated by schematic diagrams based on an arthropod. (a) Two segmental ganglia, showing lateral and connective nerves. (b) One ganglion with one sensory neuron, one motor neuron and an interneuron. cell body. Neurons involved in long-distance signalling have a long, cablelike process, the axon, which is devoid of most intracellular organelles. Other processes are shorter and often branch repeatedly; these are usually called dendrites. 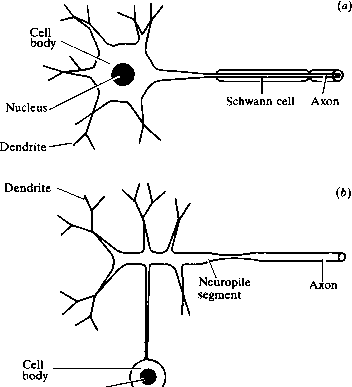 In most vertebrate neurons, the dendrites and the axon emerge from the cell body, but in many invertebrate neurons the cell body is separated from the branching region and lies at the end of a thin process, or neurite. In many neurons concerned with local signalling the axon is short, and may even be absent altogether. Neurons with no axon are called amacrine cells and all their processes are dendrites. The precise arrangement of axon and dendrites varies greatly among neurons, and different types of neurons can be identified from their particular branching pattern. Sometimes the pattern can be very complex, as in the case of the pyramidal cell in Fig. 2.1. 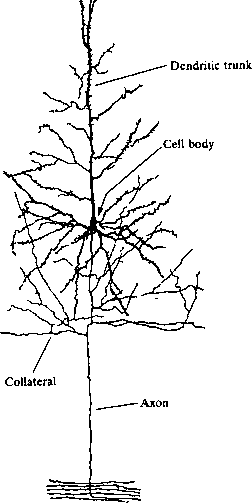 Here, the many dendrites arise not only from the cell body but also from a stout dendritic trunk. The axon is relatively thin, and it gives off axonal branches called collaterals fairly close to the cell body. In terms of function, neurons can be grouped into three basic categories (Fig. 2.3b). Neurons with specialised endings that respond to energy from the environment are called sensory neurons. Neurons that have axons terminating on muscle fibres are called motor neurons. All other neurons are interneurons. Some interneurons connect relatively distant parts of the nervous system and have long axons, but many are amacrine cells or have short axons, and these are often referred to as local interneurons. As well as neurons, the nervous system contains cells that surround and support the neurons, and these are called glial cells (glia = 'glue'). Neurons tend to be clustered together in structures called ganglia (Fig. 2.3). In clearly segmented animals, such as arthropods or annelid worms, there is one ganglion for each body segment, although in many species the ganglia of adjacent segments are fused together. A segmental ganglion contains the motor neurons that control the muscles of its segment (Fig. 2.3a), and axons from the sense organs of the segment run into it along lateral nerves. Ganglia of adjacent segments are linked by relatively stout nerves called connectives, which consist of bundles of axons that almost all belong to interneurons. Ganglia occur in many non-segmented animals, such as molluscs, and some aggregations of neurons in the vertebrate central nervous system are also called ganglia. In most invertebrate ganglia, the cell bodies of motor neurons and interneurons occur in a thin rind on the periphery of the ganglion, and the core that contains axons and dendrites is called the neuropile. Although neurons are separate entities, they are connected together in specific ways to form circuits, in which signals travel from cell to cell along particular pathways. In the simplest pathways, signals pass from sensory neurons straight to motor neurons, but most pathways involve several interneurons. During the operation of a nervous system, signals pass sequentially from place to place in individual neurons, and from neuron to neuron in a circuit. As a general rule, the dendrites of a neuron are where it receives signals, and the axon terminals are where the neuron transmits signals onwards to other neurons or to muscle cells. A neuron adds together signals that it receives from other neurons and usually converts them into a new signal that it may pass on. 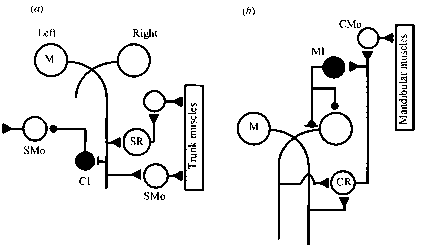 The process of combining inputs together to produce a new output signal is called integration. ganglion cells. The retinal ganglion cells have long axons with fine, branched terminals in the optic region of the brain. Thus, information about vision must flow through this sequence of connections from the receptors through bipolar and retinal ganglion cells to visual centres in the brain. In such a sequence, neurons are often referred to by their order in the chain, so sensory neurons are first order, bipolar cells second order, retinal ganglion cells are third order and cells in the brain are higher order. Signals do not just flow sequentially from cells of one order to the next, however, but also flow laterally. 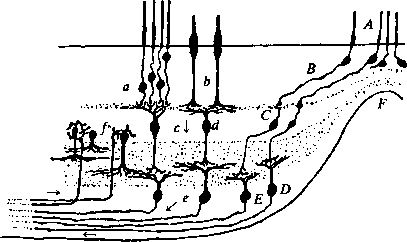 Ramon y Cajal indicated this on the left of his diagram (Fig. 2.4) by showing retinal amacrine cells that contact the dendrites of retinal ganglion cells and axon terminals of bipolar cells. The amacrine cells serve to modify signals as they pass from bipolar cells to retinal ganglion cells, and may allow activity in one bipolar cell to modify the information that its neighbouring bipolar cells transmit to retinal ganglion cells. In addition, there is another layer of horizontally oriented cells in the retina, the horizontal cells, that lies at the level of the junctions between sensory neurons and bipolar cells. Are amacrine cells motor neurons? Why is it difficulut to see the organisation of nerve cells? Why is it difficult to see the organisation of nerve cells?